Chewy, peanut buttery, and easy? Yes, please! Without much effort, you can whip up these No-Bake Peanut Butter Bites. It’s the 1950’s, and you are hosting an open house for the holidays. In an hour, all of your friends will be joyfully crowding your little place, which is decorated to the tee with tinsel. You are the perfect host, drinks are on ice, mistletoe is hanging in a few key spots, and you have cookies in the oven. Oh no, the cookies…you forgot about them while you were getting dolled up. You run to the oven and yup…they are scorched; blackened to a crisp with no return. The neighbor’s dog would turn his nose up to them. So what are you to do? The cookies are to be the centerpiece dessert. Being the ever prepared lady you are, you don’t worry one bit. The quick, easy, no-bake recipe up your sleeve, is sure to be a hit. 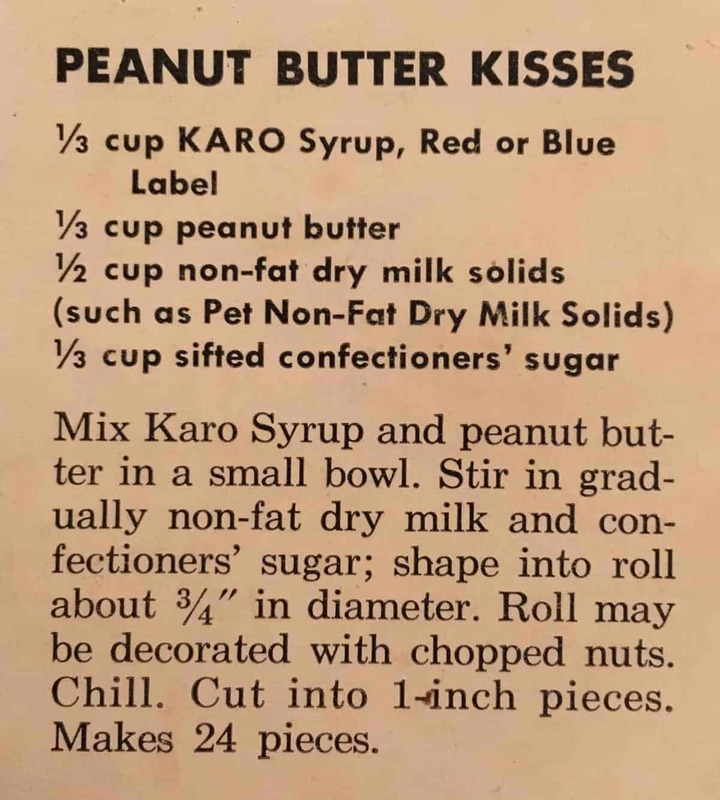 You open up “Fancy Cookies, Festive Candies: Delicious Goodies for Giving,” and thanks to the magic of Karo Syrup and peanut butter, your party goes off without a hitch. Okay, obviously I’m not a time traveler. I have no idea if this situation really happened, but doesn’t it seem totally relatable? I know I’ve left things in the oven too long while getting ready for a party…and I (basically) cook for a living! We are all so busy trying to do a million things while also being the perfect host. Things can definitely fall thru the cracks. That’s why no-bake recipes are fantastic for parties. 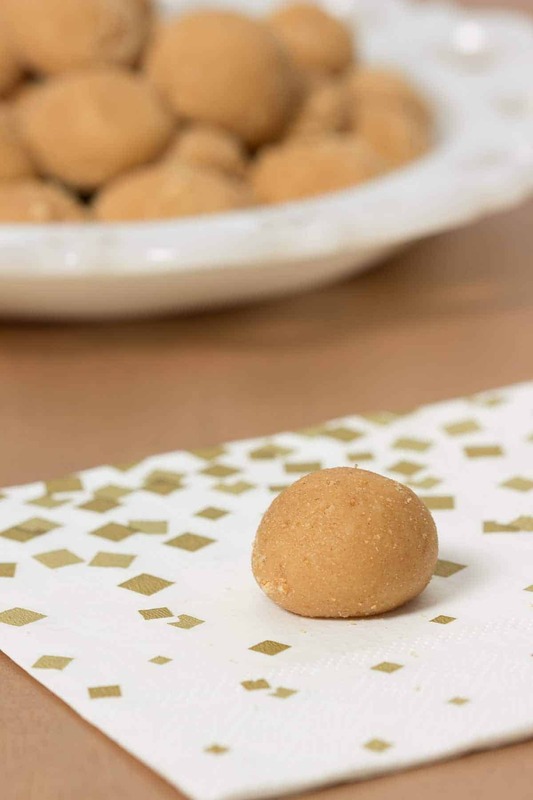 These No-Bake Peanut Butter Bites are insanely easy. Only five ingredients, and no cooking involved…just a little elbow grease when mixing the dough together. Not only are they easy to make, they are delicious. You know how wonderful it is to eat spoonfuls of peanut butter out of the jar while standing in the light of the refrigerator at midnight? (Yes, right? Good, I knew I couldn’t be the only person!) This recipe evokes those same magical feelings of eating spoonfuls of peanut butter in the privacy of your home, but you can eat them around your friends, during the day, and not be judged. I promise. This easy No-Bake Peanut Butter Bites recipe is inspired by a recipe for Peanut Butter Kisses published in the 1956 recipe pamphlet “Fancy Cookies, Festive Candies: Delicious Goodies for Giving.” My Simple Rich Refrigerator Fudge recipe also comes from this pamphlet, and most of the recipes included in it are very easy, and, you guessed it, make great gifts. The only catch is the pamphlet promotes Mazola Corn Oil and Karo Syrup, so every recipe has one or the other. After testing the original Peanut Butter Kisses recipe, I found the dough to be pretty stiff, and not enough peanut butter flavor. As usual, I changed the ratios for this version a bit. Now my No-Bake Peanut Butter Bites are perfectly peanut buttery. I also added a coating of finely crushed graham crackers, just for funsies. 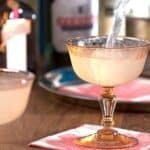 You may have noticed, many vintage recipes use corn syrup, specifically Karo Syrup. Corn syrup found its way into the American home during the mid 19th century. Along with brown sugar, it was often used to make desserts. It was sold commercially as a generic product in grocery stores. 1 The American Homemaker, apparently, carried empty jugs to fill at the grocery store to stock up on corn syrup! 2 That process sounds like no fun, but at least they got a workout on their way home! Carrying jugs of store brand corn syrup around was the norm until 1903. That’s when The Corn Products Refining Company of New York and Chicago was formed and introduced individual, manageable sized bottles of Karo Syrup.3 Since then, there have been tons of interesting advertising campaigns for Karo Syrup, and it’s become a key ingredient for many desserts, like these No-Bake Peanut Butter Bites. What do you think about these little bites of peanut buttery goodness? I’d love to hear your thoughts below in the comments! 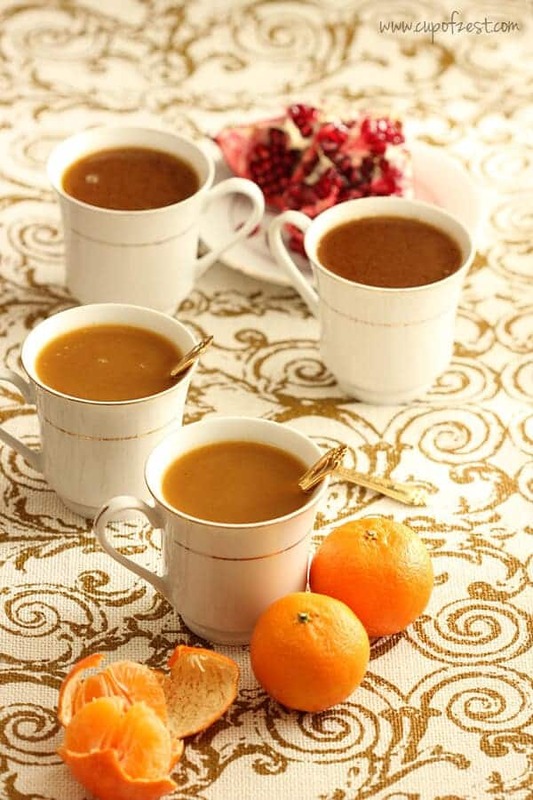 -You will need to use some elbow grease when mixing the ingredients together! You can do it! -I prefer to use a creamy, non-separated peanut butter in this recipe (you know…not the “all-natural” variety). 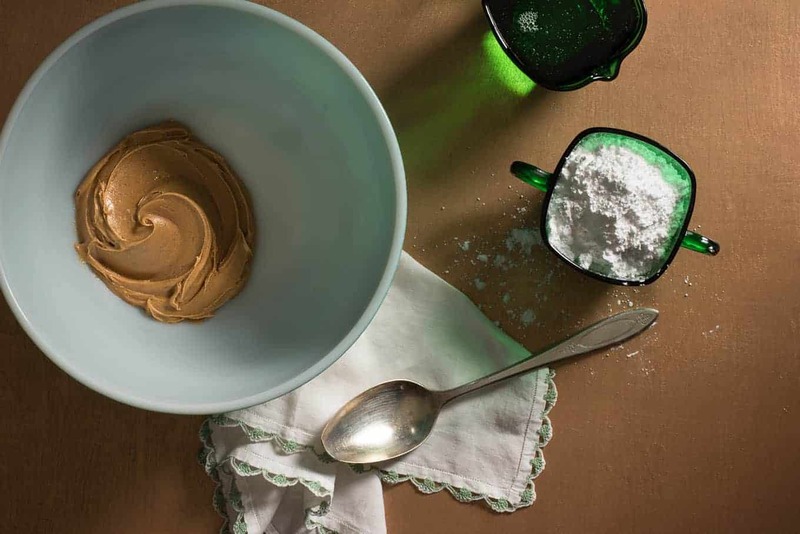 You are more than welcome to try it with natural peanut butter, but you may need to up the amount of powdered sugar or milk powder to balance out the extra oil. -Did you know that there is a difference between corn syrup and high-fructose corn syrup? 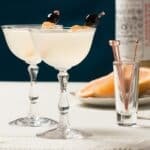 Check out this article “Corn Syrup vs. High-Fructose Corn Syrup: There Is a Difference” if you are interested in learning more! 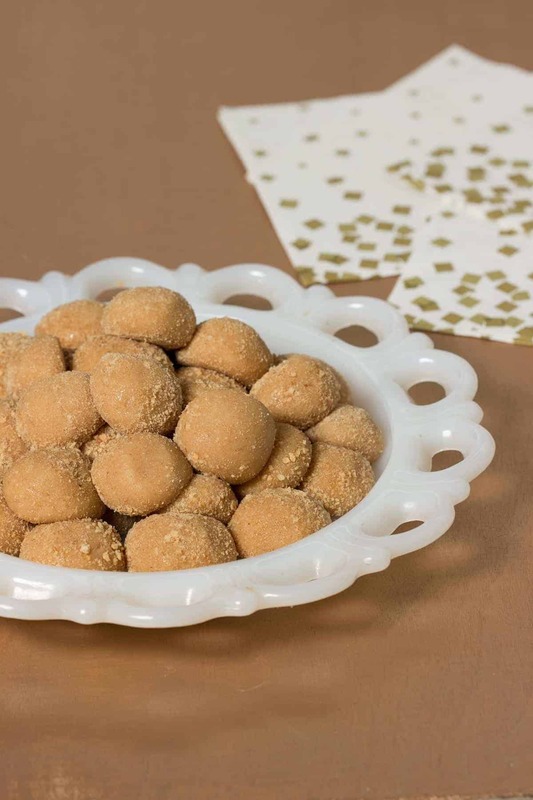 These 1950’s inspired No-Bake Peanut Butter Bites are easy to make and full of peanut buttery goodness. Great for a last minute dessert. Thoroughly mix peanut butter and corn syrup in a medium bowl. Add the non-fat dry milk powder and powdered sugar. Stir until combined (this will take some elbow grease!). Take 1 teaspoonful of the dough and roll into a tight ball. Roll in the crushed graham cracker crumbs and place on a baking sheet lined with parchment or wax paper. Chill for at least 30 minutes and serve! These are best stored covered in the fridge. Smith, Andrew F. “Food and Drink in American History: A “Full Course” Encyclopedia [3 Volumes].” Google Books. N.p., n.d. Web. 30 Nov. 2016. “Karo Syrup – About Us.” Karo Syrup – About Us. N.p., n.d. Web. 30 Nov. 2016. No bake cookies are the best, especially peanut butter cookies! Thanks for sharing. They sound yummy! And a perfect snack to whip up for a party around Christmas time too. Great idea Corna! They are wonderful for Christmas parties. Timeless, gluten free and who doesn’t love peanut butter?! Simba & Pippin…I honestly didn’t even consider that these could be GF! These sound totally delicious. No bake is great when you are pressed for time, or you don’t like to bake. Even the kids can help with these. I love anything peanut butter, and these look SO good! And I love that they’re easy too! These sound like a great treat for my peanut butter lovas! Tanya, the totally are. If you get a chance to make them, I’d love to hear how everyone liked them! Lucky for me it is not my kryptonite…but it is my boyfriend’s! He ate all of them when I was done shooting the photos! Love this recipe! 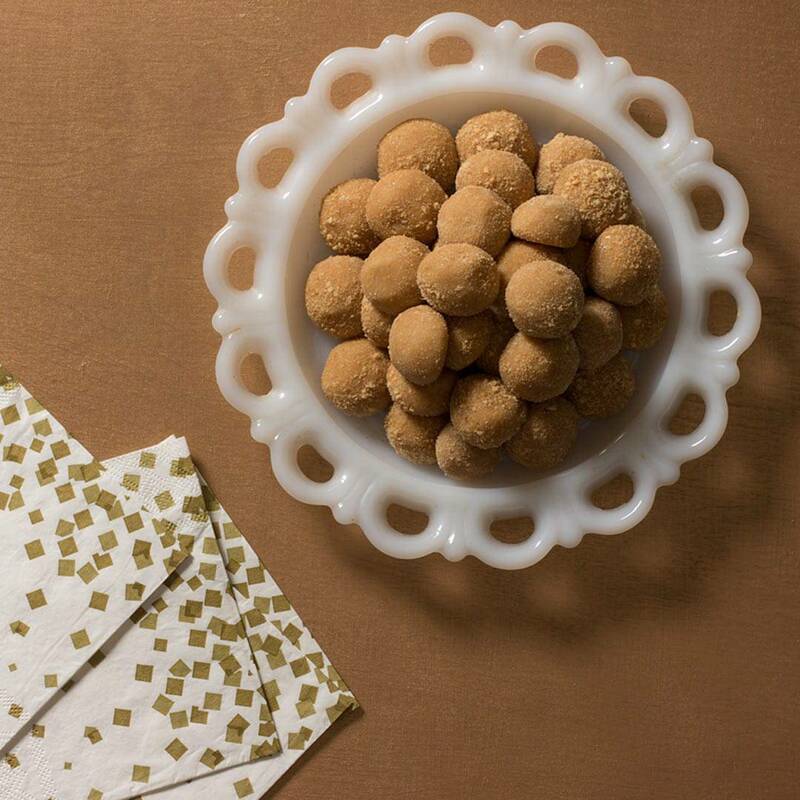 Like Italian chocolate truffles but with peanut butter! A perfect treat for holiday! Yay! 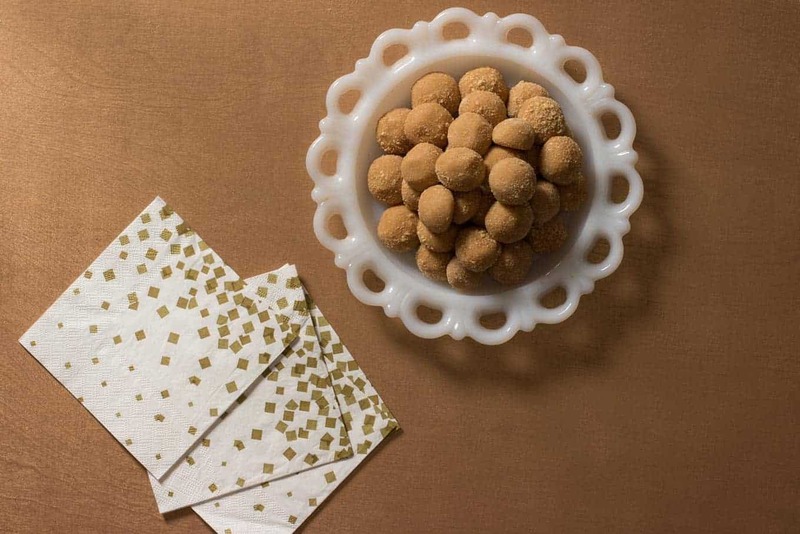 I’ve never had Italian chocolate truffles before, but they sound wonderful! Yes please! 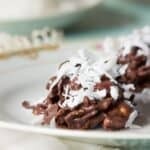 What a fab recipe, I love no bake recipes, perfect for a busy time like Christmas. Thanks for sharing. Thanks, love! 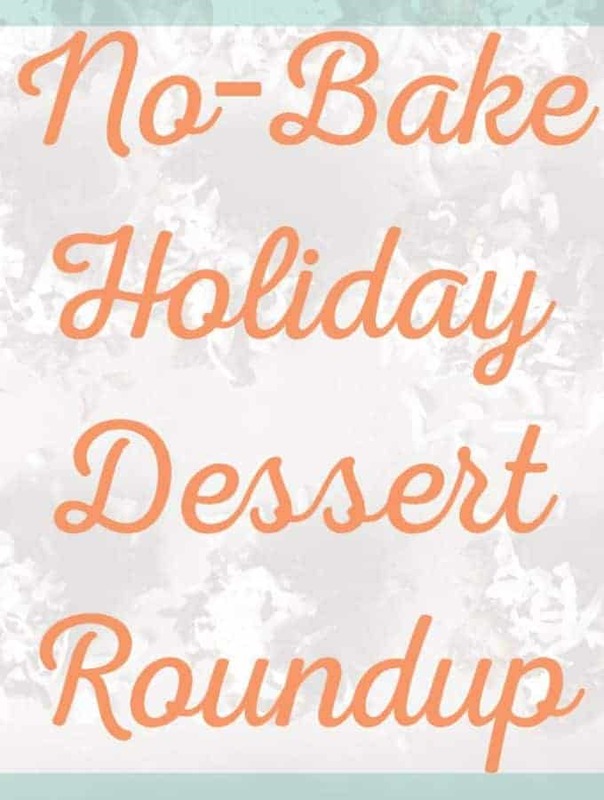 Yes, no-bakes are so great for busy times of the year. These wouldn’t last very long at my house. My husband and son eat peanut butter like it’s going out of style. Hahaha…my boyfriend is the same! He ate all of them! love peanuts! Those little bites are simply irresistible, great for the holidays! Thanks! They are so tasty and I love peanuts too! They sound wonderful! Thanks for the little history lesson! No problem! I’m super passionate about it, so it fun to share! Full of peanut butter goodness! I love the retro feel of your blog and how you included the original recipe image. Reminds me of my childhood and my grandmother. I make something really similar with honey instead of corn syrup. You can actually omit powdered sugar and just add the dry milk to the consistency you choose. Makes them a little more lunch box friendly. Yum!! Also pretty similar to the wicked expensive PB Bites you can buy in the store. Oh Amber! Those are fantastic tips, and I love how you suggested making them more lunch box friendly!